Virginia can now, if it wishes, raise the speed limit on some limited-access highways (like Interstates) to 70 miles-per-hour. Gov. Bob McDonnell signed the bill Thursday that raises the speed limit to 70 but the Virginia Department of Transportation say it will take months to conduct traffic studies to see what roads can handle the higher speeds. Jason Bond, Salem District spokesman for VDOT, says budget cuts that led to staff reductions will slow down the studies to determine where drivers are driving faster. Got a news flash for VDOT. People are already driving at least 70 on the Interstates. Many drive faster. Blast by a radar-running Virginia State Trooper at 72 miles-per-hour and we won’t even look up from the readout on his speed-monitoring machine. 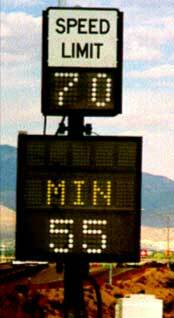 Troopers usually give a 10 miles-per-hour leeway to drivers on the Interstate. Even on 55 miles-per-hour rural roads, troopers tell me they don’t even consider writing a ticket unless the driver is doing at least 61. Spend a morning in General District Court in Floyd and you hardly ever see a speeding citation driving less than five miles per hour over a posted speed limit unless the driver is doing something else stupid on the road. On a recent trip on I-81, I set my cruise control on 73 miles per hour. Most cars and trucks passed me. I didn’t pass anyone, even in the 14 mile of stretch near Roanoke where the speed limit drops to 60. Which raises the question: If the limit on I-81 or other Interstates eventually rises to 70, will that allow drivers to speed along at 80 without fear of getting a ticket? Probably not. It’s considered reckless driving to be at 80 or over, so they’ll probably still ticket for 80 since it’s a bigger revenue generator than a simple speeding ticket. I’m just thankful the one time I got a speeding ticket, the trooper wrote me for 79 in a 65, when I was really over 80 (company car with a crappy cruise control that drifted badly). I think pulling over when I realized I was going that fast and seeing the trooper in the median helped me just a bit. Because the interstates of Virginia supply drivers with hundreds of miles of playground, making the prospect of raising speed limits TITillating. Just as Gov. McDonnell signs this bill into law Virginia State Police do a ticket blitz on I-81 and I-95. It’s all to close a nice, big budget gap … and to intimidate innocent people on the highway.